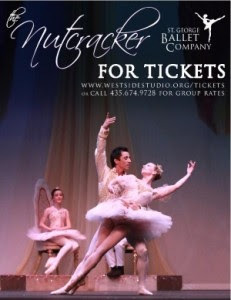 St. George Ballet Company performs The Nutcracker every year and it is always really good! A couple of my friends were always in it during high school and it was fun to go watch them. I love The Nutcracker. Some people aren't huge fans of it but I love it all! The dancing is so beautiful. On December 19th there will be a special event before the performance that is perfect for children. Clara's Magical Journey is a wonderful event where children can meet Clara and the rest of The Nutcracker cast, tour backstage, play games and eat treats. Adults are free with a paying child. Be sure to get tickets for you and your child/children. You can purchase your tickets by clicking here. Sign up for my newsletters!